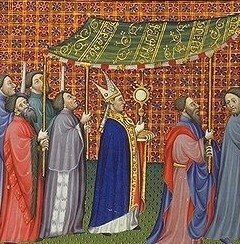 The feast of Corpus Christi has a rich fare to savor: prayers, Bible readings, music, and poetic texts. The point of the Church offering us this opportunity to honor the Eucharistic Presence is to extend in our lives a deeper grace given in Communion theology, to have a closer with the Lord in His promised hundredfold. It is, of course, a deepening in our lives what the Lord Himself did and gave to us on Holy Thursday with Eucharist and the priesthood. The Sequence (the poetry which follows the second lesson at Mass and directly precedes the Alleluia verse), Lauda Sion Salvatorem, is ideally fitting for the sacred Liturgy. Google this masterpiece of poetry expressing theology in a way that stimulates prayer and deepens one’s faith. Like the Jewish Temple, the Christian altar is the rallying point of God’s people. The whole notion of Christian solidarity grows out of, and is centered in, the common participation of a common Table. The primitive Church in Jerusalem broke bread day be day from house to house; its stronghold of peace was not any local centre, but a common meal. Christian people, however separated by long distances of land or sea, still meet together in full force, by a mystical reunion, whenever and wherever the Bread is broken and the Cup blessed. In our continuing reflection on prayer in the letters of Saint Paul, we now consider the Apostle’s striking affirmation that Jesus Christ is God’s “Yes” to mankind and the fulfillment of all his promises, and that through Jesus we say our “Amen”, to the glory of God (cf. 2 Cor 1:19-20). For Paul, prayer is above all God’s gift, grounded in his faithful love which was fully revealed in the sending of his Son and the gift of the Holy Spirit. The Spirit, poured forth into our hearts, leads us to the Father, constantly making present God’s “Yes” to us in Christ and in turn enabling us to say our “”Yes” – Amen! – to God. Our use of the word “Amen”, rooted in the ancient liturgical prayer of Israel and then taken up by the early Church, expresses our firm faith in God’s word and our hope in his promises. Through this daily “Yes” which concludes our personal and communal prayer, we echo Jesus’ obedience to the Father’s will and, through the gift of the Spirit, are enabled to live a new and transformed life in union with the Lord. 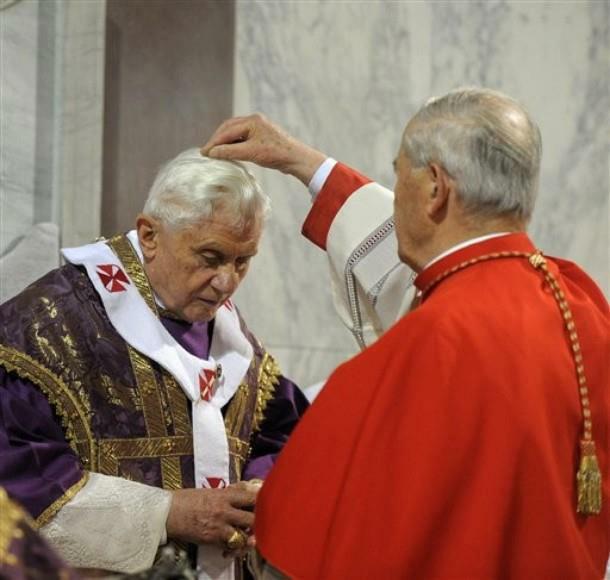 In the days following the Easter celebrations Pope Benedict XVI took time to reflect on through the form of a letter, the liturgical use of the phrase “For you and for many” that is used at Mass. With the third edition of the Roman Missal this phrase has been restored and it is has caused some people to wonder why the change after so many years; the priest had been saying “for all.” The Pope’s teaching is clear to why our liturgical praxis needs to be coherent with sacred Scripture, coherent with the Lord’s own teaching. Vatican Radio ran a piece on this issue here. Pope Benedict XVI processed from the Benedictine Church of Saint Anselm to the Dominican Church of Saint Sabina on the Aventine Hill. A long standing tradition of the popes, though it was in abeyance for several years until 1979 when John Paul II revived the tradition. The Benedictine monks welcome the Pope and his entourage for a moment of prayer and reflective before processing to the 5th century church of the Dominican Friars where Holy Mass is celebrated with the distribution of ashes. As usual, Cardinal Tomko, the cardinal titular of Saint Sabina’s gave Benedict his ashes. The following homily of the Pope’s focusses on the origins of this humble sign that assists in our recognition of salvation. Is this our recognition, too? Ash Wednesday is a day of fasting and penance on which we begin a new journey towards the Easter of Resurrection, the journey of Lent. I would like to reflect on the liturgical sign of the ashes, a material sign, a natural element that, in the Liturgy, becomes a sacred symbol, so important on this day that marks the start of our Lenten journey. In ancient times, in the Jewish culture, it was common to sprinkle one’s head with ashes as a sign of penance, and to dress in sack-cloth and rags. 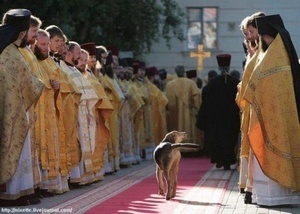 For us Christians, there is this one moment which has important symbolic and spiritual relevance. Ashes are the material sign that brings the cosmos into the Liturgy. The most important signs are those of the Sacraments: water, oil, bread and wine, which become true sacramental elements through which we communicate the Grace of Christ who comes among us. The ashes are not a sacramental sign, but they are linked with prayer and the sanctification of the Christian people. Before the ashes are placed on our heads, they are blessed according to two possible formulae: in the first they are called “austere symbols”, in the second, we invoke a blessing directly upon them, referring to the text in the Book of Genesis which can also accompany the imposition of the ashes: “Remember that you are dust and unto dust you shall return”.